March 24, 2010 - Six years of foot-dragging by Air Transport International (ATI) management while leaders of its 170 pilots and flight engineers work in good faith to pursue a fair contract is “intolerable,” according to Capt. Tom Rogers, chairman of the ATI unit of the Air Line Pilots Association, Int’l (ALPA). After joining ALPA in November 2009, ATI crewmembers continued efforts to reach an agreement in direct negotiations with management. When such an agreement was not forthcoming, ALPA recently requested the National Mediation Board (NMB) to appoint a mediator to facilitate future negotiations. ATI crewmembers are hopeful that a fair agreement can be reached promptly with the assistance of a federal mediator. However, since ATI management has indicated that it sees no reason to maintain the previously scheduled dates for direct negotiations, it remains unclear as to when mediated talks will resume. In the meantime, ATI crewmembers will pursue all options available under the law to persuade management to accept a reasonable contract. Air Transport International LLC is an airline based in Little Rock, Arkansas, USA. It operates worldwide cargo and combined charters for the express package industry and freight forwarders, as well as for the United States Department of Defense and the automotive industry. It also wet-leases aircraft. Its main base is Toledo Express Airport. The airline was established in 1978 and started operations in 1979. It was formed as US Airways and later known as Interstate Airlines. The current name was adopted in 1988. On 1 October 1994 ICX International Cargo Express was merged into Air Transport International, which was itself acquired by the Brink's Company in February 1998. ATI was sold in 2006 to Cargo Holdings International (CHI). It has 495 employees. The crewmembers of ATI fly McDonnell Douglas DC-8 and Boeing 767 aircraft for passenger, military, and cargo operations around the world. 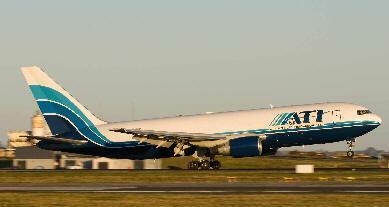 Cargo Aircraft Management was the lead customer for the Boeing 767 freighter conversion program. In the 12 months since ATI's sale by Brinks to CHI, worldwide airline profits have fallen significantly, however, ATI continues to negate this trend. Delivery of fully modernized and fuel efficient B767PF Aircraft is on track for June 2008.